The year before, a little Disney movie entitled Mulan was released and featured a song called "Reflection". She didn't record the version in the movie, but she was chosen to record the radio version of the song. If you've never heard it, that's not exactly a surprise. It's officially her first single, though, and garnered Aguilera a record deal with RCA. They quickly went to work on her very first album, the Grammy-winning Christina Aguilera. "Genie in a Bottle" still stands as one of her most popular songs, but the album showed impressive vocal range. "I Turn to You" - a song originally recorded by All-4-One for the legendary Space Jam soundtrack - is a ballad for which Aguilera's voice was praised. "What a Girl Wants" is somewhere in between those two; it's light and poppy and allows Aguilera room to show off vocally. 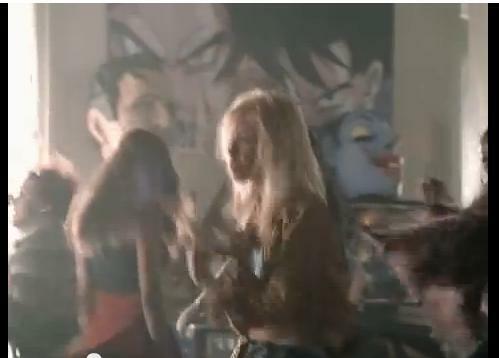 I remember the video for having a ﻿large DBZ picture﻿ in the background, so there's that. Her first album also featured a slightly more mature song called "When You Put Your Hands on Me", written by unknown-at-the-time Robin Thicke. Sounds like something he'd write, am I right? There was also a very R&B-sounding track called "So Emotional", which evokes memories of early Brandy. It was meant to be a single, but was swapped out for something more catchy. One of my favorite songs (yes, I have favorite Christina Aguilera songs) was her last single from the album, the very upbeat "Come On Over Baby (All I Want Is You)". It reminds me of Whitney's "How Will I Know", or Mariah's "Emotions". It's dance-able as hell and Christina is still able to really sing on it. The lyrics were a little more racy than other singles, but I think this may be what made the song palatable for a wider audience. The Spanish version is pretty popular, too! Christina Aguilera was as good of a debut album as she could hope for. Christina beat out Britney Spears for Best New Artist because of it. She's released seven studio albums since then. Music has since evolved to focus more on themes and melodies. If you compare this album to, let's say, Katy Perry's Witness, the difference in actual vocal ability is apparent. Because of that, I think Aguilera's first album (released 18 years ago, mind you) holds up against pop music of today.